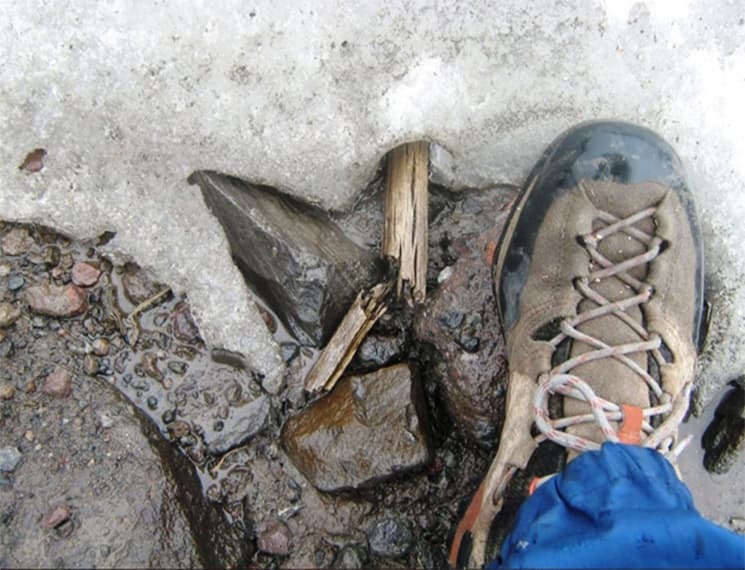 High in the mountains of Yellowstone National Park archaeologists noticed a tree stump emerging from a melting ice patch. They knew it was from another age, and a sign that they might also find ancient artifacts. Thousands of years ago when the earth’s climate cooled, ice encased trees and other organic material in the high Rockies, and made the surrounding areas wetter and greener. Animals were lured to the higher elevations for more diverse habitat. Humans followed their prey, and when they discarded tools — spears, arrows and utensils — some became trapped in new layers of snow and ice. Today those artifacts are emerging from melting ice tombs, and at a rate faster than archaeologists can collect, study and preserve them. 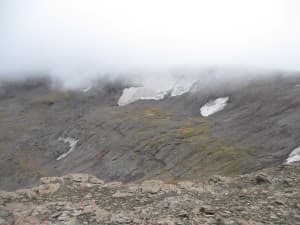 “Ice patch archaeology” is a developing field that began in the early 2000s with work in the Yukon, said Craig Lee, an archaeologist with the Institute of Arctic Alpine Research at the University of Colorado Boulder. Researchers began collecting artifacts from melting ice patches in the Greater Yellowstone about eight years ago, he said. Ice patches are not glaciers, but smaller ice formations. And unlike glaciers, which move, ice patches are stable and therefore capable of preserving materials. These ice formations can protect organic material, like wood or bones, for tens of thousands of years. Lee has found items ranging from a few hundred years old to more than 10,000 years old. Globally, archaeologists have uncovered everything from pieces of clothing to walking sticks and hunting equipment, he said. These items help scientists better understand how ancient people lived and used the landscape. These areas we now think of as rugged wilderness areas in the Greater Yellowstone were regularly used by humans thousands of years ago. The plant and animal resources provided more diversity than what the plains offered. “It was a biological powerhouse,” Lee said of the high-elevation mountains. But when ice melts today, items protected for thousands of years begin to decay quickly. There is a short window of time for when items can be collected, logged and saved by sending them to a repository for preservation. But with so many ice patches melting so quickly, archaeologists can’t keep pace. “These ice patches are hemorrhaging,” Lee said. Collecting items as ice sheets recede presents archeological challenges, said Staffan Peterson, archaeologist for Yellowstone National Park. Normally, archaeologists excavate a site at a measured pace. But with melting ice, archaeologists must chase after the receding edges at a pace that varies according to temperature, snowfall and wind. The often find items only a few hundred years old next to items thousands of years old. Figuring out what happened and when is challenging. “It’s not like people were camping on the ice, like they would at a bend on the river,” Peterson said. It’s also difficult to access ice-melt areas, which are at high altitudes and span the entire Rocky Mountain Region. 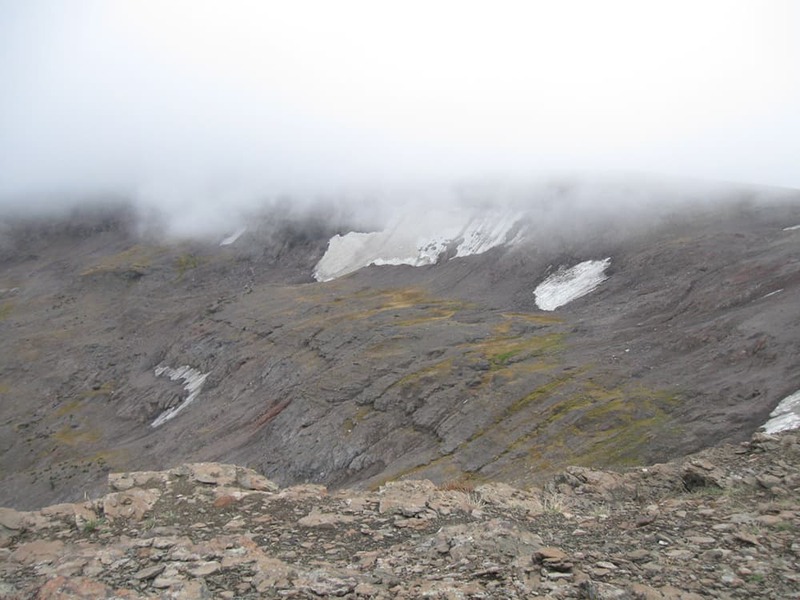 Analysis by Lee suggests there are likely 500 active ice-melt sites in the Rockies. In Yellowstone archaeologists are monitoring 10 sites. Peterson has investigated five of those sites, so far, and two sites are considered inaccessible. It also takes significant time and resources to get to the sites and perform the work, and Peterson is the park’s only archaeologist on staff. 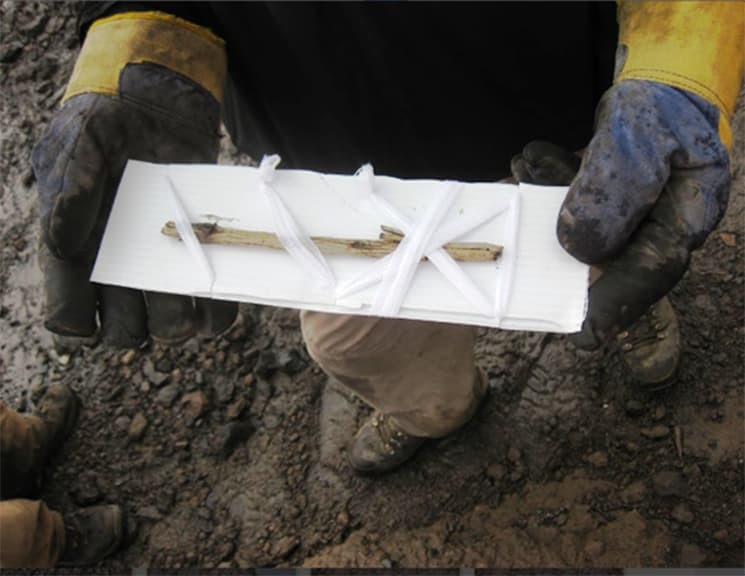 In Yellowstone, Peterson and other researchers have found animal bones, an atlatl and wooden parts of weapons such as arrow shafts. They’ve also carbon-dated leaves and tree stumps more than 5,000 years old. The artifacts released by melting ice in the high country are important because they provide excellent clues to the past. Archaeologists normally only have access to what can survive thousands of years — usually items made of stone. Yet stone tools are only a fraction of what ancient people used to survive. Ice patches, meanwhile, cryogenically preserve organic artifacts such as wood, textiles, leather and animal fur, and provide a much broader perspective of what people used in their daily lives, Peterson said. Peterson found one wooden tool he thinks was used to spread resin. It’s an item he never knew existed. Glaciers, which are bigger than an ice patch, are characterized by downhill movement. Ice patches don’t have enough mass to be pulled by gravity, so artifacts often remain unscathed and discovered where they were left. “What happens on an ice patch stays on an ice patch,” Peterson said. Taking artifacts off public land is illegal. If you find items while in the backcountry, the best thing to do is leave them untouched and contact local land-management authorities. Archaeologists can learn more about artifacts if they know where they are found. People are encouraged to take pictures and, if possible, note locations on a map or with GPS, then report to land managers. So, warmer periods, as ” Lee has found items ranging from a few hundred years old to more than 10,000 years old. 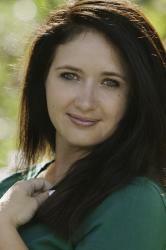 “are a natural aspect of our climate. Glaciers and ice patches are always expanding or contracting? Global warming has happen before. No big deal, ice age will happen again, BIG DEAL.